Garnish using spring onion . 1. 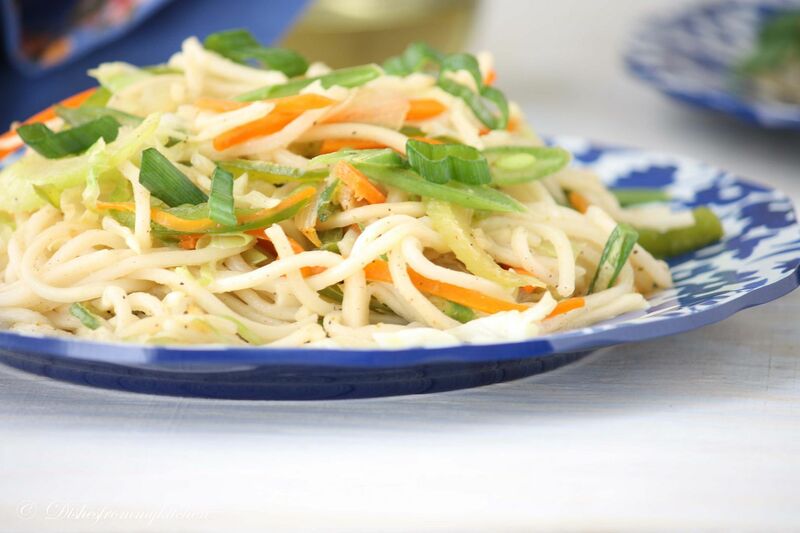 Cook the noodles in the big pot of boiling water by adding tsp of salt and tsp of oil. 2. Check a noodle by pinching . If it is hard let it cook for few more minutes. This will take atleast 6 minutes. 3. Now pour this in the colander. Show this in the running tap water to remove all the starch. So that they will not stick with each other. 4. While doing this parallely heat oil in the wok. 5. Add the crushed garlic and follow adding veggies in this way. 6. First add beans, saute for 2 seconds, followed with carrot and onion saute for few seconds. Keep the flame in high till you finish everything. 7. 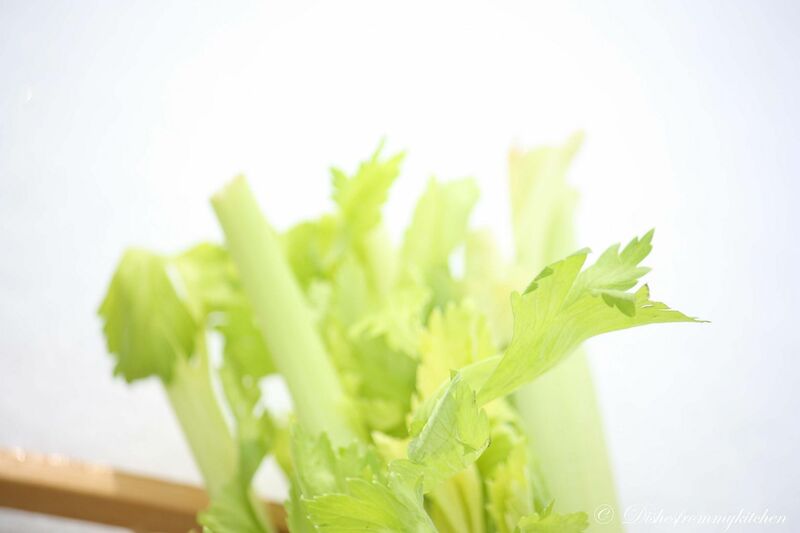 Now add celery, saute for a second, followed by Capsicum and Cabbage give a nice toss. If you want to add Ajinomoto add in this stage. 8. Add the cooked noodles, Soy sauce, Vinegar. 9. Add Green chilli sauce, salt and 2 pepper powders. 10. Now toss it in high flame until everything is well blended and hot. 12. Put of the flame, add the spring onion. 1. Keep the flame in high from start to end. Once everything is ready it just takes 5 to 6 minutes for the whole process. So keep an eye in the wok as we are doing the whole thing in high flame. Enjoy tasty and delicious hot hot Noodles !!! Noodles look so inviting and colorful. Very good explanation, traditional Chinese Noodles looks very delicious. I like the you have cut your veggies, so beautiful and perfectly done. Check out new event and giveaway at my blog.. Hats off to u for the explanation...ur clicks are awesome. I make them the exact same way - and there's always Chings in my pantry too! Love all the picture Pavi. Noodles look awesome! Beautiful!!!! 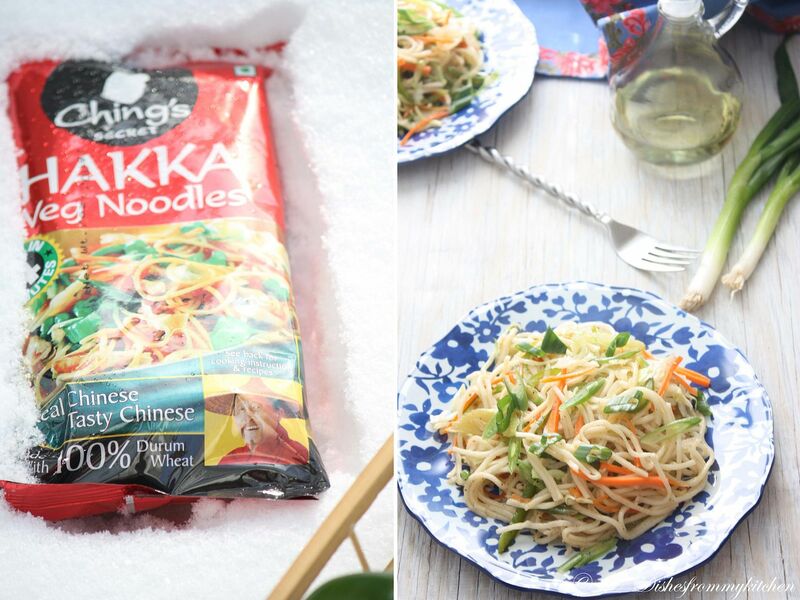 With your pictorial presentation , nothing can go wrong while i try..
Great post, Pavithra..Veggie noodles look absolutely tempting! All the pictures look great! 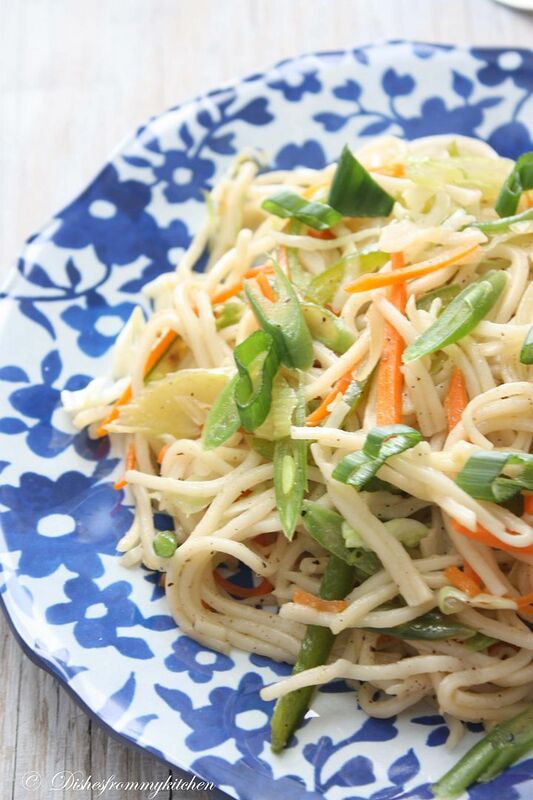 WOW Pavitra the noodles came out perfect.Looks very colourful and makes me hungry.I am great fan of Noodles. Absolute favourite... the color combo is great..
Wow,you have done a fantastic job with this post, i really appreciate the effort you have put in, and defantiely the talent behind it. Loved the photos, you have an eye for props. Look at those lovely blue plates. 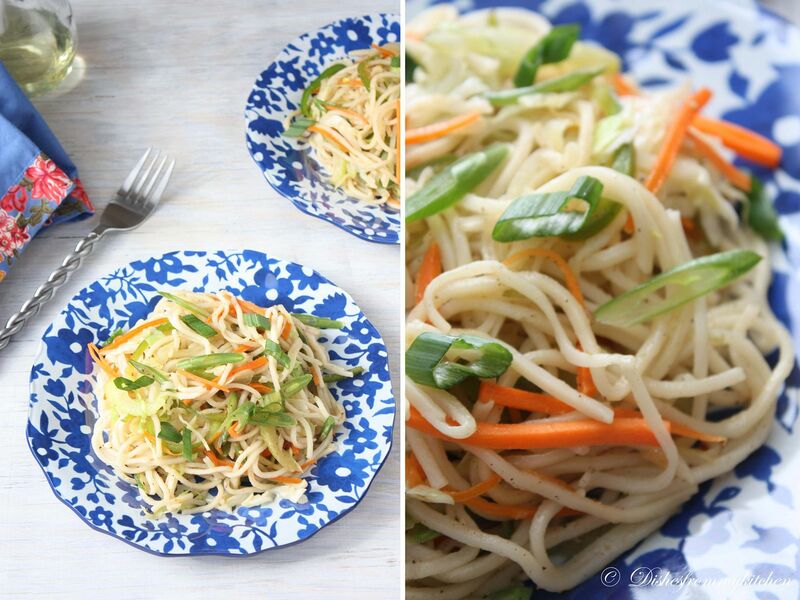 Beautiful clicks making my mouth water.Noodles look devine. Very delicious noodles, sooooo tempting.. Loved the detailed post,noodles looks so inviting and mouthwatering. lovely plate of noodles.. love the pics.. I just love love love this noodles..yummmmm!!! Pavithra,I have the same post sitting in my drafts :) With the same ching's noodle :) Lovely click Pavithra! Lovely pictorial too! Thank you for the step wise pics!... I do the same without the sauces, I'm curious to try the green chilli sauce now :).. nice pics!! LOVE it! I can have it for lunch and dinner and breakfast the next day. :) Great pictorials!! Absolutely delicious noodles. 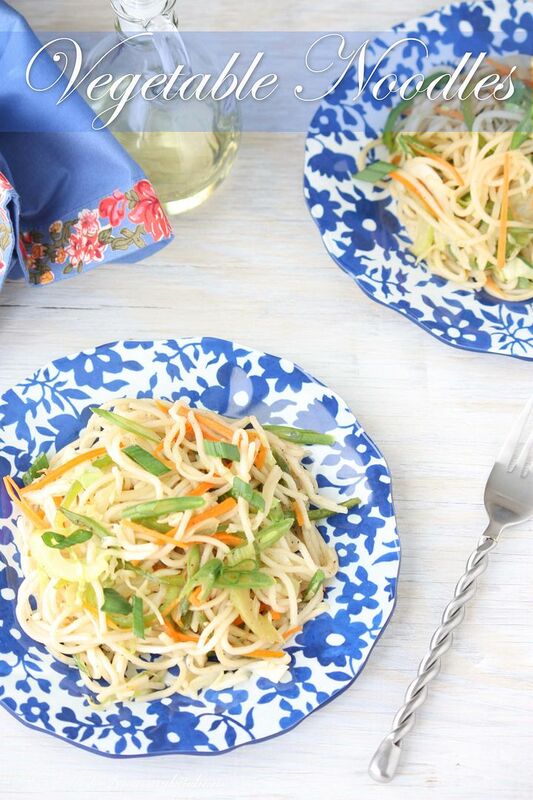 Very nice tutorial..
Noodles look delicious beautifully presented. wow! !superb pavithra....clearly explained and beautiful pic dear! !yummmmmy noodles! ooh, ilove the way u have cut the veggies.admire ur patience. Yummylicious!!!! Love the clicks!!!!! esp, love the way u have cut beans!!!! 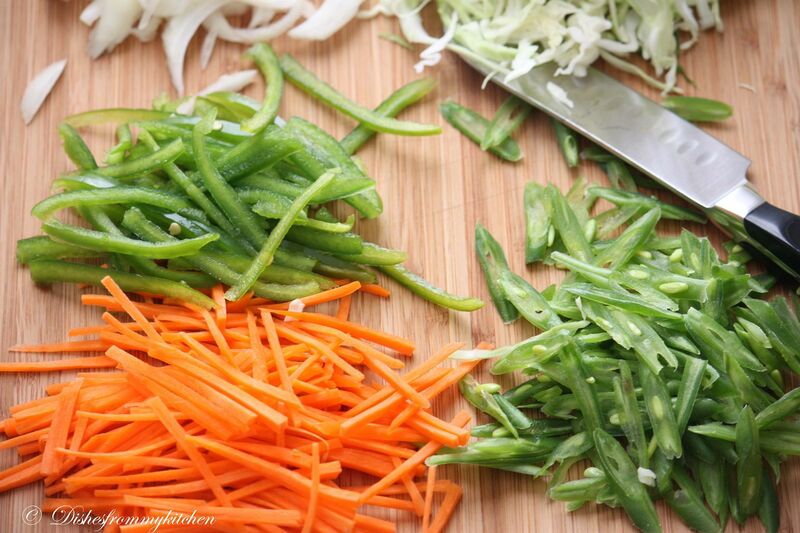 Love those clicks of shredded veggies, awesome! The noodles looks delicious. I was more fascinated by such beautifully juliened vegetables than the noodles but love this preparation anytime. I have got no mail from u dear regarding the chutney. I am loving this one... a beautiful dish. 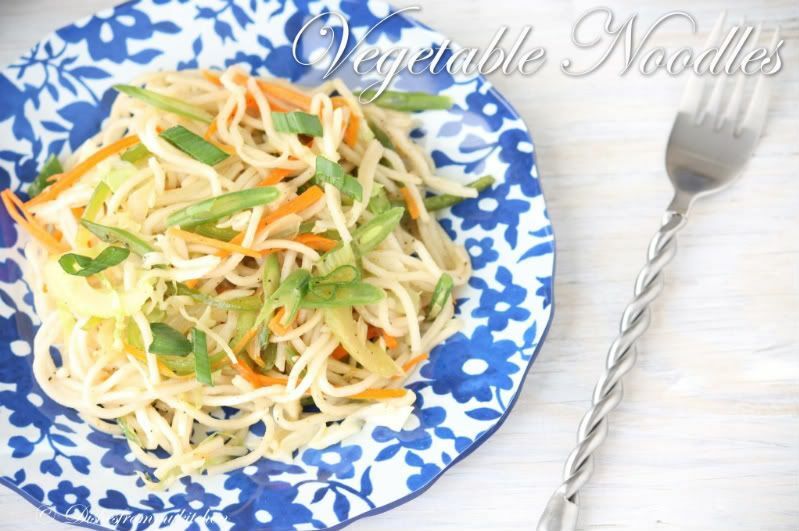 I love noodle stir-fry with assorted veggies! Healthy and delicious! Pavithra,your tempting clicks will make even the laziest cook get into action!!! LOOKS PERFECT AND VERY VERY TEMPTING...NICE POST.. I adore your passion in food styling! Now I adore your patience in taking step pics too!!! so tempting.... Pics are very brautiful... Yummy! Fantastic step by step presentation with tempting clicks.. This is very similar to what my mom makes at home. By the way, nice step by step explanation. Wow! what a great way to make noodles. Pictures are perfect and very crisp. 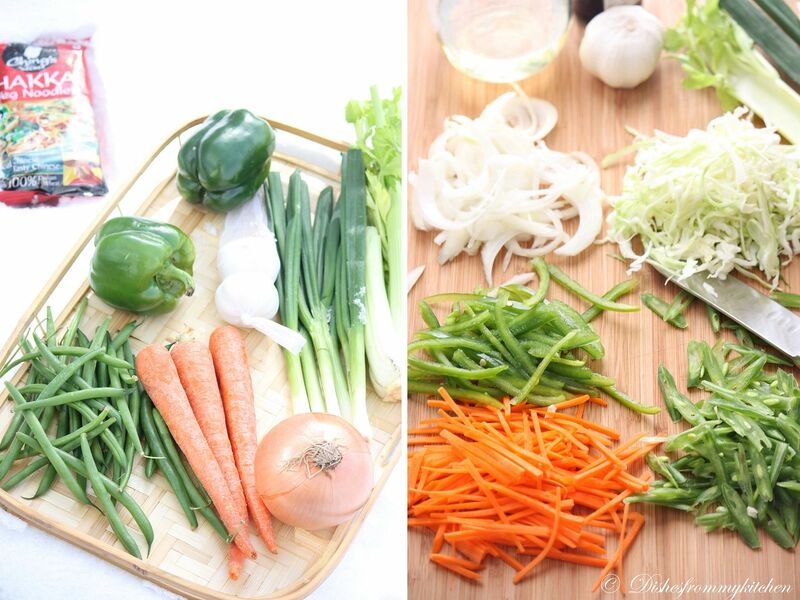 Admire the way you chopped the vegetables. Noodles looks so delicious dear. The Chinese noodles is my all time favorite. The colors are brilliant and awesome pictures. The photos are professional. Your a specialist in food styling as well as talented chef. Appreciate the detailed post.